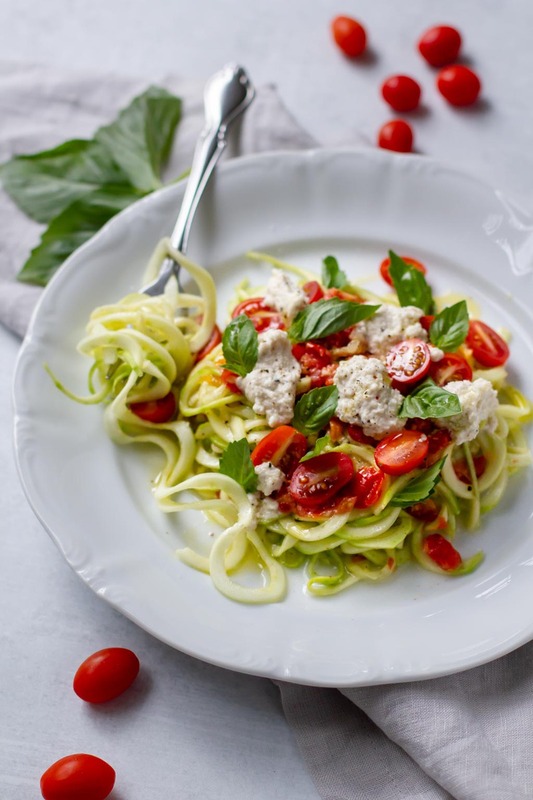 Zucchini linguini is one of my go-to raw vegan dishes because it’s so easy and fast. It’s faster than boiling water for regular pasta! This dish is delicious, fresh and very clean tasting. The simple ingredient list is key to making all the delicate flavors shine. 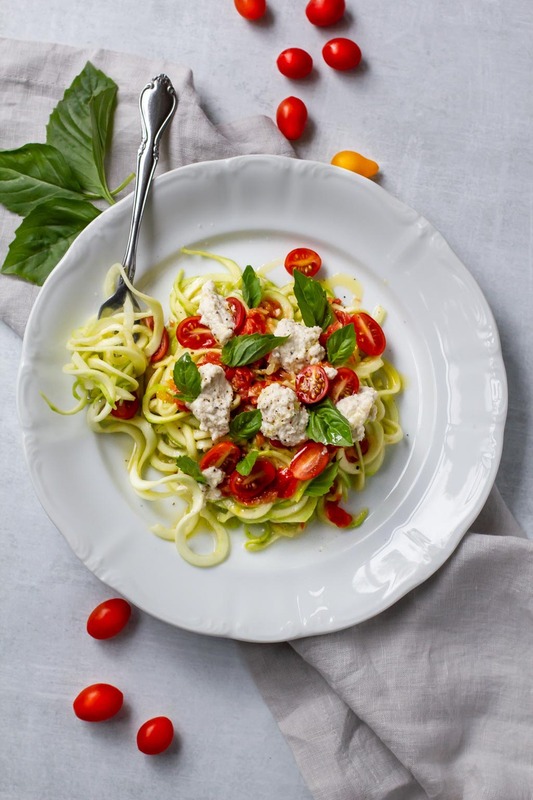 Fresh basil, tart and savory tomato and creamy ricotta are perfectly balanced, and the zucchini noodles have a neutral flavor and tender linguini texture. If you don’t have a spiral slicer, you can easily make noodles with a simple vegetable peeler! You just peel off the outer skin of the zucchini and then run the peeler down the zucchini lengthwise so you have long wide strips. Zucchini noodles can be made ahead of time and stored in an airtight container for up to 3 days. 4 medium zucchini, peeled and cut on a spiral slicer. Rinse the soaked cashews and discard the soak water. Place the cashews in a food processor and add the apple cider vinegar. Process until the cashews are creamy, adding water as needed to help achieve the texture of ricotta in the food processor. Taste and adjust seasoning by adding salt and pepper to taste. Remove from the food processor and place in a container. Stir in a little more water (little by little) until you get a chunky cottage cheese texture. Set aside until ready to use. Wash and peel the zucchini. Using a spiral slicer to make noodles with the peeled zucchini. Place the zucchini noodles in a medium mixing bowl. Drizzle the noodles with olive oil, salt and pepper. Add the minced garlic and toss well until noodles are well coated. Chop 1 cup of the tomatoes until a chunky sauce is formed. Season with salt and pepper to taste. Divide the zucchini noodles into 2 bowls. Top the noodles with the chopped tomato "sauce," halved cherry tomatoes, cashew ricotta and basil leaves. Serve immediately. If you like the cashew ricotta, try using some to make the Easy Greek Salad!